2004 Setra S 417 HDH Unit Number: 00042 Seating Capacity: 56 Engine: DDC Series 60 12.7L Transmission: Allison B-500R Please call to verify specifics and for all other questions. 2005 Setra S 417 HDH Unit Number: 00176 Seating Capacity: 56 Engine: DDC Series 60 12.7L Transmission: Allison B-500R Please call to verify specifics and for all other questions. Make: Prevost Model: LeMirage XLII Year: 2001 Seating Capacity: 55 Engine: DDC Series 60 12.7L Transmission: Allison B-500 Please call to verify specifics and for all other questions. 2002 Prevost Model: LeMirage XLII Unit Number: 27745 Seating Capacity: 55 Engine: DDC S60 425 Transmission: Allison B-500 Please call to verify specifics and for all other questions. 2002 Prevost Model: LeMirage XLII Unit Number: 27757 Seating Capacity: 55 Engine: DDC S60 425 Transmission: Allison B-500 Please call to verify specifics and for all other questions. 2002 Prevost Model: LeMirage XLII Unit Number: 27751 Seating Capacity: 55 Engine: DDC S60 425 Transmission: Allison B-500 Please call to verify specifics and for all other questions. 2002 Prevost LeMirage XLII Unit Number: 27762 Seating Capacity: 55 Engine: DDC S60 425 Transmission: Allison B-500 Please call to verify specifics and for all other questions. 2003 Prevost LeMirage XLII Unit Number: 27972 Seating Capacity: 55 Engine: DDC Series 60 12.7L Transmission: Allison B-500 Please call to verify specifics and for all other questions. 2003 Prevost LeMirage XLII Unit Number: 27998 Seating Capacity: 55 Engine: DDC Series 60 12.7L Transmission: Allison B-500 Please call to verify specifics and for all other questions. 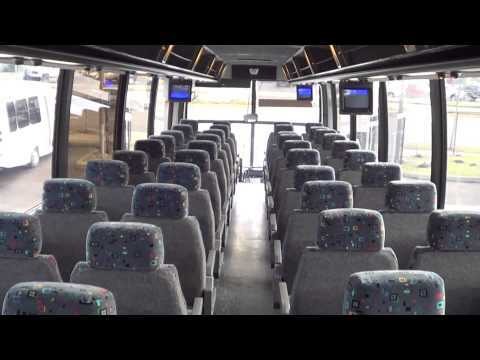 1996 MCI 102-DL3 Unit Number: 48102 Seating Capacity: 54 Engine: DDC Series 60 12.7L Transmission: Allison B-500 Please call to verify specifics and for all other questions.